Columbia’s libraries possess a rich array of resources, and sometimes having so many options available to you can be a little confusing. If you need help with anything library-related, but find yourself nowhere near one of the Columbia libraries, don’t fret! 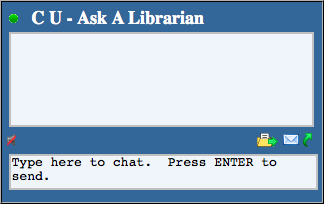 Ask a Librarian is here to save the day. Sunday: 4 p.m. – 10 p.m. Try it out at the website linked in the first paragraph, or add ‘askcolumbia’ (without the quotation marks, of course) to your AIM, Google, MSN or Yahoo! buddy lists and send us a message from your favorite chat program. You can even text the service at (215)TEXTCUL or (215)839-8285, and we’ll respond in 140 characters or less! This entry was posted in Columbia University Libraries, Research Tips and tagged Columbia Libraries on April 11, 2011 by Cris.